If you ever investigate a case and hope to learn the truth of it, be sure you make a detailed timeline. It will be much more difficult to do (and do well) than you now suspect. It will be much more valuable than you now imagine. Time is rather persistent. It refuses to run backwards. It keeps its own books, with infinite precision, but makes no particular effort to reveal or conceal its journal entries. If you can somehow find the journal entries for the crime you may someday investigate, if you can build a detailed and accurate timeline, you stand an excellent chance of finding truth. There is a specific time that hovers like the Sword of Damocles over the heads to the Houston Police Department. That time is 2:58 AM, 27 September 1988. That is the time that someone added to Officer F.L. Hale's property invoice. If that time is accurate, then the arrow of time reveals uncomfortable truths about this case. 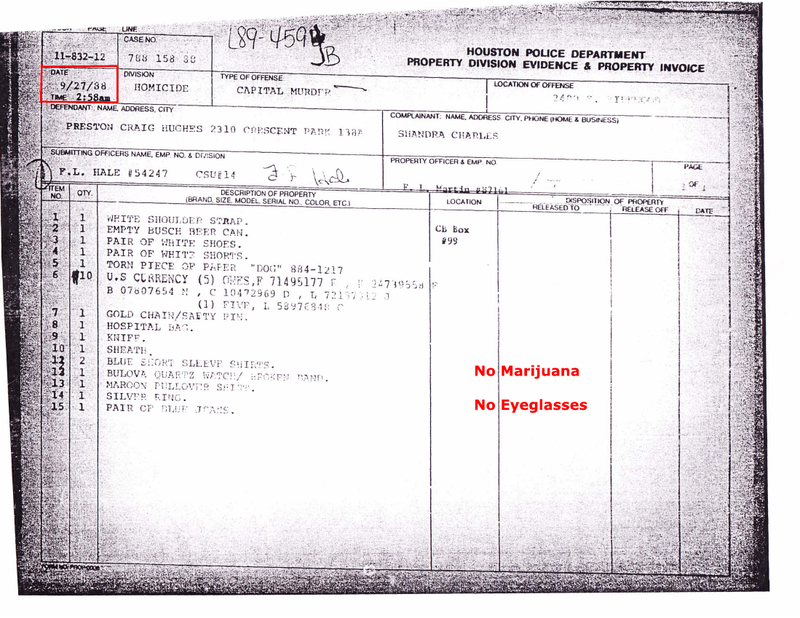 The HPD must have recovered the items from Preston's apartment prior to 2:58 AM on 27 September 1988. The HPD must have searched the apartment without a warrant, for they never obtained one in this case. 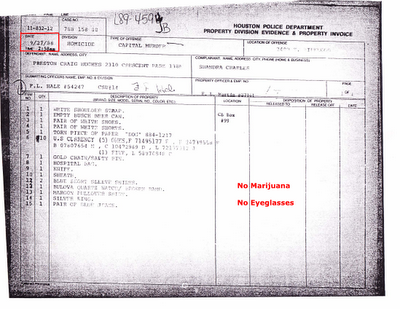 The HPD must have searched the apartment without a voluntary consent for search form, manufactured or otherwise. The only such form was (allegedly) witnessed at 5:35 AM. The HPD must therefore have conducted an illegal search. More significantly, the HPD must have conducted two searches: one prior to 2:58 AM and one after sunrise. The photos of what must have been the second search show the lights off and daylight coming from behind a sheer curtain. 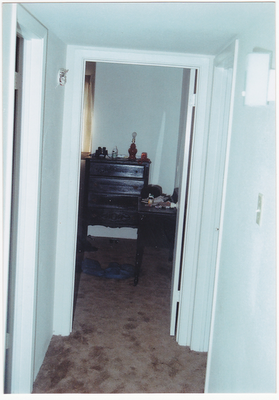 The police must have removed from the property locker the items they had collected during the first search and returned them to Preston's apartment so that they could photograph them during the second search. The items photographed during the second search would therefore have been staged. 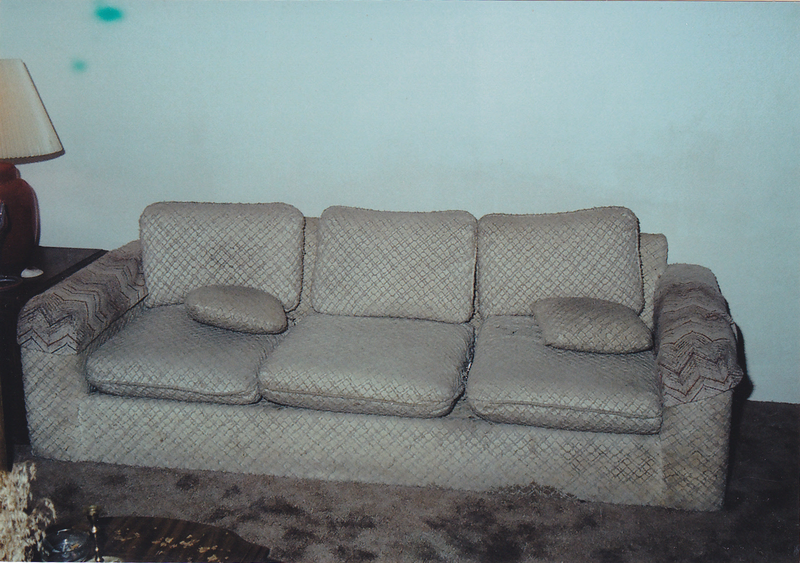 The eyeglasses photographed between the cushions of Preston's sofa were photographed during the second search, along with the other items. 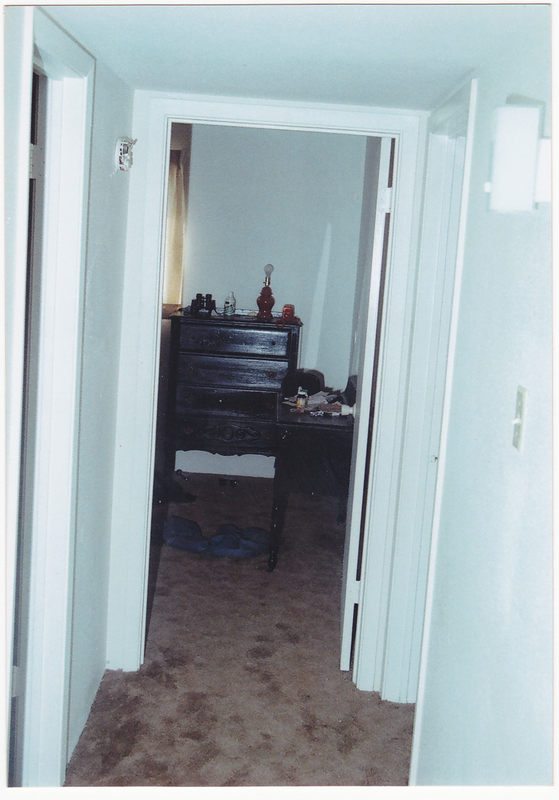 The photograph shows the room to be naturally lit and the lamp to be off. The eyeglass must have therefore been staged for the second search, just as the other items were staged for the second search. The 2:58 AM time, if it is correct, proves that the police planted Shandra's glasses between the cushions of Preston's couch. 2:58 AM hangs like the Sword of Damocles. That time must therefore die a death of a thousand cuts if the police are to be not exposed. Those cuts will become an subtle undercurrent flowing almost unnoticed throughout the trial. The time itself will never, however, be uttered. For now, in the remainder of this post, I will consider whether the police could have searched Preston's apartment early enough to collect the data, prepare a property invoice, and turn the evidence into the property room at 2:58 AM. I will limit myself, for the time being, to information available before the trial. If the 2:58 AM time is correct, and I give Officer Hale 18 minutes to type the property invoice and perform other miscellaneous tasks, Officer Hale must have arrived back at police headquarters no later than 2:40 AM. I believe the property locker was located in or near the police headquarters building at 61 Riesner in downtown Houston. According to Google Maps, it is a 27 minute drive from 61 Riesner to the corner of Kirkwood and Westminster. We'll call it 30. Officer Hale would have had to leave the area of Preston's apartment no later than 2:10 AM. I give Officer Hale 30 minutes to take the photographs of the items inside Preston's apartment, and to secure those items in plastic bags. That means Officer Hale must have entered Preston's apartment no later than 1:40 AM. Officer Hale, however, could not have entered Preston's apartment until Preston had been placed in the patrol car, and that would not have occurred until Sgt. Gafford (and others) knocked on Preston's door, entered his apartment, questioned him briefly, and allowed him to dress. If I give Gafford and Preston (and others) 20 minutes to do that, then Gafford must have arrived at Preston's door no later than 1:20 AM. Sgt. Gafford, however, claims he spent some time searching through the tenant list before he knocked on Preston's door. I happen to have a copy of that tenant list. I just searched it, in no big hurry, and I timed myself. I managed to get through it in 3 minutes and a few seconds. Preston's name was the last one on the first page. I'll give Gafford 10 minutes to search the list. He must have therefore begun searching the list no later than 1:10 AM. According to the ME investigator's report, Marcell was declared dead at 11:38 PM. The ME was notified at 11:45 PM. We can assume homicide was notified around that time as well. Given a 30 minute drive from police headquarters to the crime scene, Sgt. Gafford could have arrived as early as 12:15 AM. That would give him 55 minutes to peruse the crime scene, talk to the other officers there, and find his was to the manager's office, where he would read the tenant list. In summary, the timing is possible, but tight. If Gafford first knocked on Preston's door at 2:30 PM, as a number of people claim, then the 2:58 AM time on the property invoice cannot be accurate. This timing issue will, I predict, eventually become a source of heated debate. I suggest, however, that it can be resolved by releasing all the chain of custody documents, including those tracking the items into and out of the property locker, including those tracking the items into and out of the labs. 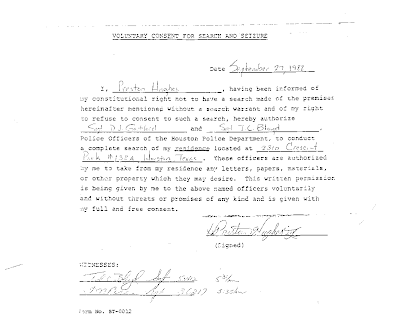 The issue can be resolved also by providing a contemporaneous log of all pictures taken by Officer Hale, a log he certainly should have maintained. How else would the people who relied on the photos have known when and where they were taken, and what they were intended to capture? I for one welcome and encourage the release of all such case documents. I have no fear of 2:58 AM. You mention 27 September 2012, which hasn't happened yet. :) I think that should be 1988? Whoops. Thank you for the save. I've corrected the post.